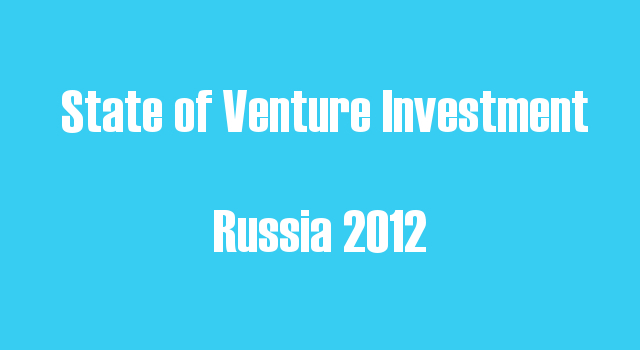 Last month, the Russian Venture Company (RVC), released a pair of reports on the status of venture investment in the Russian Federation. RVC, which was established in 2006 as a government fund of funds, released a joint report (Russian) with public-opinion research center WCIOM and a report with the Russian office of professional-services firm PWC. In the reports, the case is made that, although the volume of investment has increased, investor preferences and actions have changed and we are beginning to see a shift to later-stage deals. According to the report released by RVC and PWC, the overall volume of venture investments reached an estimated $910.6 million (~704,3 million euro) in 2012. For the purpose of the report, “major” deals of more than $100 million (77 million euro) in value have been excluded. From the report, we know that IT represents the lion’s share of venture investment, with $792.1 million (612,6 million euro) directed towards this industry. For the IT sector, this represents a more than doubling of the previous year’s total of $392 million (303 million euro). Broken down by investment stage, there’s strong evidence that investors have developed a preference for companies which have traction and demonstrated potential for growth. In 2011, there were 77 deals completed at the seed-funding stage, 34 at the startup, 16 at the early-growth, and 3 at the expansion. In 2012, however, we observe a drop to 60 deals at the seed-stage and increases to 65 at the startup, 31 at early-growth, and 12 at expansion. When broken down by funding round, we again see a shift in preferences for later-stage companies. 72 deals for $27.9 million (21,6 euro) were completed at the seed-funding stage and 47 deals for $124.3 million (96 million euro) at the Round A stage in 2011. In 2012, seed-stage funding grew to $35.6 million (27,5 million euro) from 80 deals and there was an increase to $132.5 million (102,5 million euro) from 53 deals at the Round A level. Incremental increases, but certainly improvement. The real growth was witnessed at the later stages, however. In 2011, there were 14 deals competed in the Rounds B, C, D, and E for $198.5 (153,5 million euro) and in 2012 the figures increases to 22 deals for $492.5 million (380,9 million euro). Thus, we basically saw a whopping 150% increase in the volume of investment at the later stages from ‘11 to ‘12. Finally, the authors note that there were 12 exits for $372 million (287,8 million euro). Also included in this report was information on grants awarded in 2012. All told, there were 702 grants awarded for $145 (112 million euro). In terms of grants awarded, the Bortnik Foundation easily led the way at 130 awarded for IT-related projects. However, the amount of funding they dispersed ($3.9 million/3 million euro) was dwarfed by the amount given by the Skolkovo Foundation, which gave $26.5 (20,5 million euro). Also making the list was an organization well-known to us, the Moscow Seed Fund. They ended up awarding 13 grants for $500,000 (387,000 euro) last year. Rounding out the list were “others”, which awarded a total of 26 grants for $1.1 million (851,000 euro). government institutes will play an important role in the development of seed-stage investment between now and the year 2020.